*Many thanks to the Baddish Group for the sample. As one lands on St. Patrick’s day and nears the 100th anniversary of the Easter Rising, one relishes the chance to guzzle sip some Irish whiskey and delve into a little more Irish history. As St. Patrick’s Day has become something of a bloated, grotesque, commercialized cartoon, it’s interesting to look back and discover that, in Ireland at least, it was not always thus. In fact, for a long time, you couldn’t even buy booze in Ireland on St. Patrick’s Day. On March 17th, 1916, an Irish nationalist group called the Irish Volunteers coordinated pro-independence marches all over the island. A little over a month later, The Easter Rising occurred. After the Easter Rising got the ball rolling, and the Irish fought a war of independence…and then fought a civil war, everyone finally settled down enough to create The Irish Free State at the end of 1922. As an independent state that was still part of the British Empire, the Irish Free State existed until 1937, when the Republic of Ireland was established. One imagines public gatherings at this time gaining a certain amount of enthusiasm because of this newfound self-rule. As a result of the celebrations getting a little out of hand on what was supposed to be a religious holiday, the Free State government decided in 1927 to prohibit the sale of alcohol on St. Patrick’s Day. At the time, the Irish temperance movement and the Catholic church wielded quite a bit of influence, and the ban was seen as a relatively positive thing. As time wore on, however, the ban was increasingly seen as unnecessary and out-of-step with the rest of the world’s St. Patrick’s Day celebrations.In 1961, the ban was lifted. As history has shown all too often, nobody likes to be told that they can’t buy a drink. Speaking of a drink, Teeling Single Malt Irish Whiskey (nice segue, eh?) 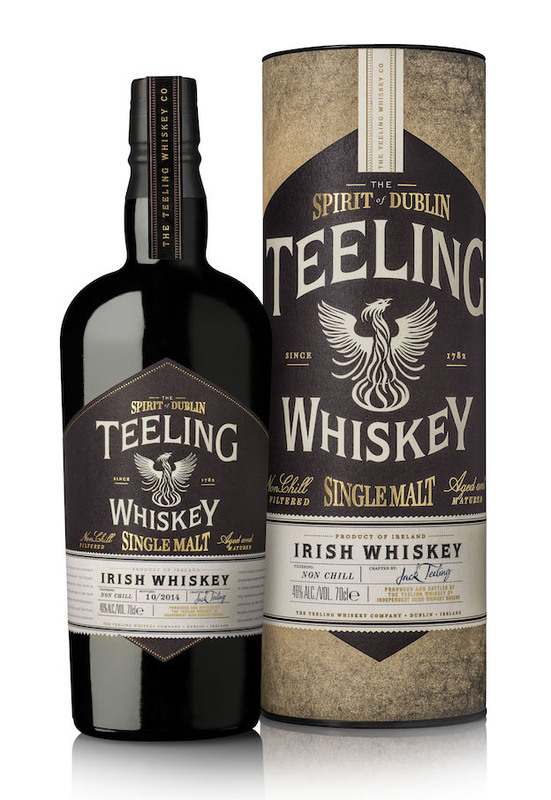 is one of three core expressions for the Teeling Whiskey Company, the others being the Teeling Single Grain Whiskey and the Teeling Small Batch blended Whiskey. The Teeling name has quite a bit of pedigree in the history of whiskey. Back in 1782, Walter Teeling set up a small distillery and a little over 200 years later in 1985, descendent John Teeling bought an old schnapps distillery, converted it to whiskey making, named it Cooley, and went on to play a major part in the revival of Irish whiskey. The Cooley distillery was at the time the only independent distillery in Ireland and the brands and styles that Teeling introduced harkened back to a time when Irish Whiskey was far more popular and far more diverse than it was in the 1990’s. In 2011, Cooley was purchased by what was then, Beam Inc. (now Beam Suntory), and John Teeling retired from the whiskey business. Thankfully, his sons, Stephen and Jack, decided to continue this family tradition, and founded the Teeling Whiskey Company. The company began as an independent bottler, purchasing old stock from Cooley, releasing limited edition whiskeys and eventually solidifying the core range we see today. Teeling has also built the first new distillery in Dublin in over 125 years, which began production in 2015. The Teeling Single Malt Irish Whiskey is composed of several Cooley-distilled malts, ranging from young up to some whiskeys distilled in 1991. The whiskeys were finished in a heady combination of Sherry, Port, Madeira, Cabernet Sauvignon, and White Burgundy casks. A great many mentions of this one get that wrong. The Teeling literature states that the whiskeys used here were finished in the wine casks, they did not fully mature in the wine casks. Still, an Irish single malt even being finished in that array of oak is a noteworthy thing. Also noteworthy is Teeling’s laudable decision to bottle this non chill-filtered and at 46% ABV. The Nose: Bright, lush and densely complex. Quite a bit of fruit: poached pears, white grape juice, and red fruits mostly in the form of mixed fruit preserves. Dessert notes of sugar cookies, vanilla bean ice cream, white chocolate, and a little spiced fruit cake. There are subtler touches of floral honey and malt syrup. All this sweetness is balanced by sturdy polished oak, burnt sugar, Vietnamese cinnamon, a bit of clove, and a hint of lemon oil. The Palate: Wow. A thinly oily mouthfeel full of more fruit and spice. The red fruits come across as more dried here and are joined by plump, dark raisins and bit of orange citrus. There’s more honey, more fruitcake, a bit of butterscotch even, and a light nuttiness. The oak is stronger and more tannic, with spice notes of ginger, clove, and peppercorns. The Finish: Mostly sort of medium-ish with lingering notes of brown sugar, dried fruit, oak, allspice, and pepper. Thoughts: This is a great whiskey. There’s not all that much about it that screams “Irish” to me, but that’s not a complaint. In a way, it manages to transcend stylistic labels. The variety of wine casks used for maturation have given this a delightful complex fruitiness and, I’m guessing, the combination of ages used has lent just the right amount of oak and spice. It progresses with elegant balance from start to finish, managing to feel well-integrated while giving space to all that analogous complexity. This is currently retailing for between $50 and $60 and, I think, well worth the price. Definitely recommended. Teelings are one of my fave new generation of distillers. Glad you enjoyed the Single Malt.